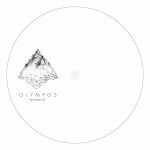 Review: The Olympos series continues its exploration of godly themes and adventurous techno with a third instalment, this time calling on Demetra, the goddess of the harvest and agriculture. There's a consistently deep tone to all four of the tracks on offer here, employing swooping pads and undulating bleep lines to conjure up a warm, early 90s feel that would sound right at home on an early B12 single. "Pump It" is especially deep, using the barest of ingredients to take you on a dreamy, machine-powered trip.